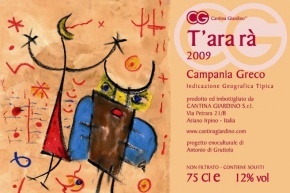 Cantina Giardino was born as a joint venture between six friends, Antonio di Gruttola, Daniela De Gruttola, Davide De Gruttola, Pasquale Giardino, Antonio Corsano and Nadia di Gruttola. We started this project with the specific aim of preserving old vineyards and native varietals within our home of Irpinia. We started this project with the specific aim of preserving old vineyards and native varietals within our home of Irpinia. Irpinia is a mountainous area located in the region of Campania, east of Naples on the Apennine mountain ridge. Altitudes range from 450 - 700 meters above sea level. The predominant soil type is limestone, often with volcanic contribution. In some areas clay dominates, and the Irpinian subzones vary to such an extent that rare situations such as sulphur deposits form the basis for exciting soil composition. The continental climate is dramatically effected by high altitudes along the mountain ridge which expose Irpinia to the Balkan Tramontana as well as the African Scirocco winds. Campania has a rich history intertwined with wine originating with Magna Grecia, Greater Greece. Grape varieties and their names derive from Greece. The most prestigious wine in ancient Rome was Falerno (Latin Falernum), originating on the northern Massico mountain ridge. Many important grape varieties of the South are indigenous to Campania. Aglianico is considered one of the most complex red grapes in Italy. White varieties Greco and Fiano can also produce profound wines. There are many more autochthonous varieties worth discovering. Irpinia is home to famous wine appellations such as Greco di Tufo, Fiano di Avellino and Taurasi for Aglianico. Irpinia is probably the last vineyard area in Europe to harvest, with whites picked in October and Aglianico until the end of November. This provides for amazingly long vegetation cycles which favor complete polyphenolic ripening. The adventure officially began in 2003 in Ariano Irpino in the heart of Irpinia. From 1997 Antonio and Daniela, with the enthusiastic support of Daniela’s brother Davide, Antonio’s sister Nadia, and close friends Pasquale Giardino and Antonio Corsano, had been secretly training for this moment, by producing home-made wine in recycled bottles under surplus cork. Theirs is a ying and yang dynamic, Antonio the quiet, thoughtful one whereas Daniela bubbles with emotion. 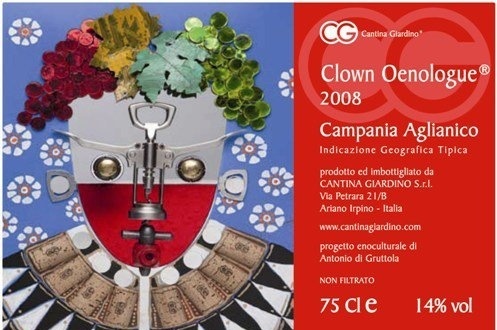 Before 2003 Antonio worked as the oenologist behind the scenes for one of the big boys in Campania. You can imagine the stink that he kicks up today by choosing to produce non-oenological wines. In fact, if it hadn’t been for Daniela’s ebullient determination Antonio may never have taken the final step toward producing his own wines, and what a loss that would have been. Thus Cantina Giardino is a family affair, composed of the couple Antonio di Gruttola and Daniela de Gruttola (not the same family, imagine the statistical probability of that! ), a brother and sister and friends. They call it an Oeno-cultural Project. Currently they manage 7.5 hectares of vineyard. 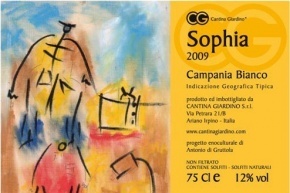 One of the main motivators of Cantina Giardino is their cultural treasure, the old vines of Irpinia. In Campania there is an abnormally rich concentration of centenarian grape vines at risk of abandonment or uprooting. The local populace does not always comprehend the priceless value of these vines. Low yields, manual-intensive labor, depopulation of the younger generation and EU subsidies for replanting are quickly transforming the Irpinian landscape. Daniela has futilely tried for years to engage the public, press and politicians in an awareness campaign to protect this heritage. After having garnered support for an EU-funded study the funding disappeared and things are back to normal. Almost but not quite, Cantina Giardino has since been flooded with requests from farmers to help maintain and manage old vineyards and purchase grapes. Antonio has more supply of 80 - 100 year old vines than he can physically manage, poor soul. It’s old hat to underline that a top producer seeks only the best grapes. A new twist on an old theme is that Antonio seeks to reflect the color of the grapes from the specific grape variety of the specific vintage in the wine glass. To achieve authentic color, reflection of vintage, grape and terroir character Antonio macerates whites as well as reds. Since 2003 Antonio has worked part-time as a chemistry teacher to support the Project. With the ongoing positive developments Antonio’s school days will be over in September. After focusing their attention on centenarian vines since initiating their wine voyage, Daniela and Antonio have planted their first vineyard this spring. Located next to one of their best vineyard sites in Montemarano where their future wine cellar may one day take shape, the new vineyard is an important massal selection of Fiano, Greco and Aglianico cuttings from very wise vines that have been been grafted by an artisan. Vinification takes place in the downstairs of the building where they live, and the space is already very confined. When a new cellar sees the light of day it will push the wines even higher. How exciting to watch genius in the making. I love what they’re doing now, thus it makes me want to jump up and down at the prospect of what lies in store for us in future. I was comforted this last visit to Prague by Antonio and Daniela that not even Antonio remembers the precise use of different wood types, a few vintages were different grape varieties from the current vintages, periods of maceration, etc… this is high art! Essentially it’s not so important. I know I’m taking a shot at the ivory towers of oenology, yet only through gate-crashing conservatism with innovation, insubordination, anarchy and unrelenting vision can greatness be achieved. Antonio goes even further by favoring genuine wine even at the cost of consciously retaining wine faults, over perfect, soulless wines. However, the unalienable reality drinking his wines over the years is that Antonio aims for purity. First-time tasters of our wines are often confused and perhaps don’t like some of them. This is neither surprising nor unsettling to me. The vast gulf between conventional, sterilized wine character and authentic, spirited wine is wide. The customer who wishes to seek out true beauty and complexity will be rewarded by the wines of Cantina Giardino. Antonio sees his interpretation of vinification partly as a refutation of standard oenological practices. Spontaneous fermentation without pied de cuve, no temperature control, long macerations, ageing in local, used wood barrels from Chestnut, Acacia, Cherry, Mulberry and Oak, on the fine lees for the duration of the wood ageing. Neither stabilizers nor filtration, no additives oftentimes not even added sulphites before bottling. Another unique vinification method Antonio uses is consciously not topping off the wine levels in the barrels. This is obviously another absolute no-no in the wine establishment, since a barrel will loose wine during ageing and a lower wine level will introduce oxygen in the top hollow of the barrel, which will induce oxidization of the wine. 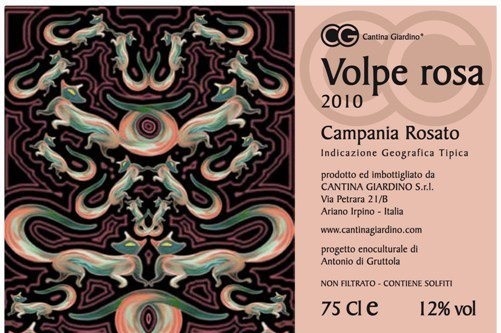 Antonio welcomes this practice, firstly because his hale and hearty grapes are naturally resistant, but more importantly oxidization allows a major micro-organismic flora to develop which also welcomes volatile acidity. Thus any one barrel is a three-tier stratification of an upper level oxidized wine, a lower strata which becomes increasingly influenced by the continuous dynamics of the fine lees, and a central body which is less effected. If bottling took place directly from the barrel this principle would produce at least three very different wines. Instead the barrel contents are sensitively decanted into another container where the wine amalgamates for a couple of days before being bottled. Yet another chapter is vinification in amphorae. Terracotta clay vases inspired by Georgian qvevri have been exciting curiosity from quality producers in Italy since Gravner brought over the first examples in 1996. The attraction is finding a vessel in which to vinify wine while enabling the wine to breathe without wood influence. A further advantage is that amphorae are porous enough to allow hermetic closure while fermentation takes place, thus protecting the wine from oxidisation and making the addition of sulphites redundant, all the while slowing the vinification process enough to allow for outrageously long maceration periods of up to a year. One of the curious end effects I have noticed from most amphora wines is the ability to produce a wine which is already rounder and seemingly more mature from a young age. This has also led to a possible misassumption from professionals that a mature, young amphora wine will not show great ageing potential. Once more, this small difference of choice of vessel is probably much more complex than would appear at first sight. Antonio is convinced that the ubiquitous addition of sulphites in wines greatly inhibits drinkability. Even more curiously, tannin and anthocyanins are apparently extracted from skins and pips (or worse from wood) up to a certain point during maceration, after which the process is reversed. Grape stems are another source of tannins and anthocyanins. Bunches are normally destemmed because they are astringent. However if grapes are fully ripe this isn’t always the case. An example is Aglianico Clown Oenologue. Bunches are placed whole in the amphora for a whole year. Also, long-macerated wines can be surprisingly light coloured and less affected by tannins than would be expected. For a tannic grape with huge structure such as Aglianico this is an exciting turn of fate, thus Antonio’s excitement with clay. And once more, Antonio takes the amphora a step further. While several producers dig down their amphorae in the same terroir where the grapes for the wine grow so as to create a holistic environment, Antonio actually pressured his ceramic artisan producer friend into makes amphorae from Antonio’s very own Irpinian clay terroir! Complimentarily, Antonio explains that dowsing wine with sulphites literally railroads its expression by placing the character of the wine on locked-in tracks which will ultimately finish in a conical point on the tip of the tongue. It is common knowledge that industrial wines with sulphites are subdued and tense until they have seen very long bottle ageing (that’s one of the reason why collectors are so fascinated by old vintages). By the time the bottle is opened the sulphur levels will have dramatically decreased. It is obvious when drinking a variety of Giardino wines and when drinking higher quantities that the wines are remarkably inviting, wholesome… and drinkable. Antonio’s key word for describing great wines is “drinkability”, something that is helped by higher acidity levels in wines. With the amazingly late harvests in Irpinia, Antonio favors picking just before full ripeness in order to retain more drinkability. I hope you will find Giardino wines as drinkable as I do.